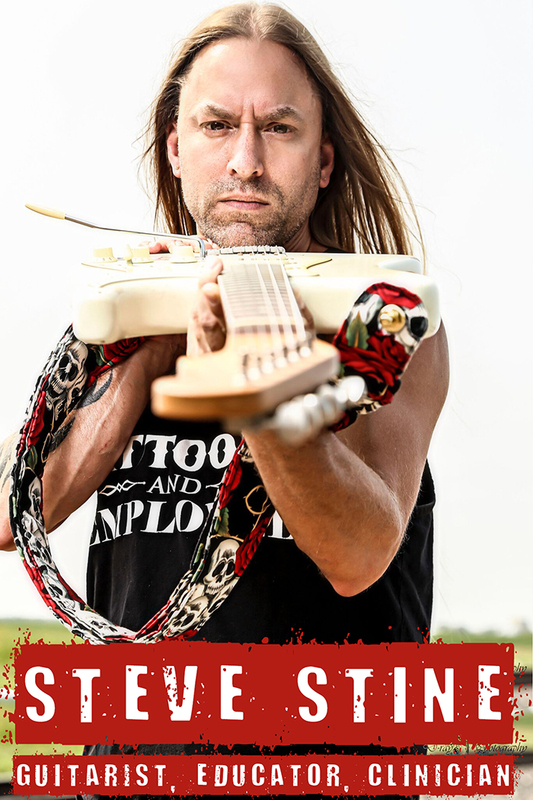 Steve Stine is known as the world’s most sought-after guitar instructor. After years of struggling to understand how the guitar “really works,“ he developed a step-by-step training method to help you quickly overcome obstacles and rapidly advance your playing to a level you never dreamed possible. He has created over 40 full length guitar courses and Masterclasses for Guitarzoom, and literally hundreds (if not thousands) of instructional videos on various social media and guitar-related channels. Over 30 years, he’s helped literally millions of guitarists in over 100 countries. Stine has been rated in the top 10 Guitar World lessons 3 years in a row. He holds a bachelor’s degree in music education from Minnesota State University, Moorhead. And he’s played lead guitar in dozens of bands, touring the U.S. and UK. He’s a featured guest instructor at Guitar World Magazine and the distinguished former Prof. of Modern Guitar Studies at North Dakota State University. Steve started playing at age 13 and attended college at age 17 (graduated early from high school) studying Music Performance at Moorhead State University in Minnesota. His love of teaching began early (age 17), and this celebrated educator and private lesson guru has been teaching lessons in various forms ever since (private, group, online, seminars, webinars, and clinics worldwide). Stine was a Montessori Music Instructor for over 15 years. He continued as Professor of Modern Music Studies at North Dakota State University in Fargo for 4 years. An active performance career began at age 23 that took Stine on celebrated world tours throughout the US, Canada, and Europe and flavored his teaching with a stronger sense of the music business and myriad genres of music. Stine is married and has two children. Steve Stine currently has 157 reviews 5 Star reviews on Google. "Absolutely the best online guitar teacher. Steve has a way of explaining music theory that is easy to understand and relative to playing. He is obviously an exceptional guitar player but his lessons aren’t him just showing how good he is. He truly makes you believe that you can become that good too. I’ve played guitar for about 25 years. I could play a lot of songs but I could never improvise or solo on my on. In the last 2 years of learning from Steve, I’m twice the guitar player I was. I understand theory and even modes! Finally, he’s just a really good dude. Can’t recommend him enough!" "Steve is an amazing guitar instructor!!! Although I've never met or talk to him in "real life"..in his videos he comes across as an amazing person. His teaching style is such that he makes you relaxed and comfortable...and actually makes you look forward to learning. As a person with an anxiety disorder..i find it easy to relax and learn from him. His videos are easy to follow and they are produced in a way that it's like he's right in front of you...one on one!!! I personally look forward to many lessons from him. Keep up the great work. God bless you." "Some people have the gift of teaching, others have the gift of being more into how they look or sound when they attempt to teach. I have purchased a few of Steve’s courses because of what I saw on YouTube. Steve has that ability to connect with you and draw you in to what he is showing. He knows what he’s talking about, gets to the point, and is prepared with his content as opposed to rambling, which really blows when you paid hard earned cash for a product and are dedicating precious time to it. The camera angles and explanations of what is being shown are super important, and Steve does this well, making sure you see what he’s dong and understand it. Not that this is really important, but I have been playing guitar since I was in junior high-I am now 50 years old . I have progressed to a point , but had several questions. Steve was able to connect the dots for me in the places I had gaps in my understanding.. In all that time of playing I had a lot of people tell me what I was doing wrong, but not many could show me how to correct it and even less WOULD show me anything period. I have played in clubs, parks, and Beach Venues from 50 to 3,000 plus people. Even though I did okay, I could only play at a certain level with my self taught ways. Steve Stine is helping me change that, so that my playing and fretboard mastery is much improved, which improves my self confidence as well. If you haven’t tried learning from Steve Stine, or are on the fence about it because you’ve been disappointed before, I strongly encourage you to give Steve a try. You won’t be disappointed." "Steve is absolutely the best online teacher there is. Everything I know other than a few chords I owe to you. I’ve played for almost 35 years. I would play for a while then get stuck and bored with it. Steve breaks everything down into simple terms and makes it fun to use his lessons. That has really kept me focused. Thanks to Steve I “absolutely” know the minor pentatonic scale. I had fun learning it and it has been the best thing I have ever done to improve my playing. Thanks to him for taking time to share his knowledge and skills. Grateful for all he does for so many." "Simply the best! Steve is a amazing teacher. His passion is undeniable, I'm excited about learning the fundamentals of music because of this man! Thank you for sharing your knowledge of the instrument Steve. You continue to keep it both fun and informative. I can honestly say that I'm beginning to finally find my voice of my soul on the guitar." I would have no hesitation in recommending Steve Stine to anyone searching for an outstanding online Guitar Instructor. He is beyond doubt one of the best online Instructors in the business. This recommendation is directed at anyone who wants to make steady, solid progress on their instrument. Kind Regards Sean McDaid"
"Steve Stine is a wonderful guitar teacher. Not only is he an incredible artist, his teaching method is awesome. His explanations and videos are crystal clear and very thorough. The courses come with support plus videos and PDFs that you get to keep forever. While his courses include what a student needs to build a solid foundation, improve technique, etc., the lessons also have a way of encouraging the student to grow as a musician (as opposed to just playing guitar a little). He teaches the player how to explore, expand, visualize and execute ideas, as well as incorporating creativity and authenticity into the music. Plus, he's really nice. :) Highly recommend." "I started Steve's online guitar lessons just a few days ago, and he's already the best teacher I ever had. It's not just his practical approach (teaching you both the math AND philosophy behind every scale and chord); his personable, "you'll get there" demeanor subtly imbues students with a sense of self-confidence that's at the core of successful learning. My guitar'd been gathering dust for years. Steve has renewed my commitment to the instrument and my belief in its power to brighten any day." "Steve has a unique way of making the lessons come alive on screen. There is such a professional quality as well; no useless time in the lessons, but you don’t feel rushed either. He anticipates your questions while preparing the lesson, making it rather unimportant that you can’t speak to him. The thing that really comes through though is his absolute mastery of the instrument, as well as his professorial chops. I’d certainly buy more but as a father of 3 my practice budget (time and $$) are limited! Steve is well worth the effort, easily the best instructor in line, and by a large margin." "For the longest time I have tried to learn how to play the guitar, until I found the perfect guitar to enjoy the art! Before long I came to realize the perfect guitar and will to learn were not the only requirements, but also one must have the perfect instructor. So I found out about Steve Stine. It was not long before I could discover indeed I have found the perfect instructor. Steve, is experienced, not only about his art but as a teacher. He makes things simple, fun and easy to understand. I have purchased several of his courses and love every one of them. I am truly grateful for his methods and can truly say he has become my inspiration in this new music learning journey. Thank you Steve! - sincerely Jonathan Rosillo." "Steve's way of teaching taught me more in two months than I learned in the last 5 years."